Have you ever looked at the ingredients in your baby’s food or even tasted it? Many parents say it tastes disgusting, includes extra ingredients or may be expensive. Making your own baby food isn’t as hard as it sounds. For the most part, you just purchase the ingredients and puree them. Another bonus, you can make extra servings and freeze the leftovers. Similar to meal prep days for your work lunches, you can have baby food prep days. Before you can make your child’s food, you’ll need to purchase some supplies ahead of time. Here’s a list of items you’ll want to have on hand to make homemade baby food. There are many different blenders you can use to puree the food. Below are some of our favorites. We’ve included their prices (which are subject to change) as well as their pros and cons. and includes a beginner set of what you need to start making your baby’s food. This is a great system but is limited in that it will most likely only be used for baby food, whereas some of these other puree blenders can be used for other recipes as well.
. Not only can you make baby puree with this but you can also make hummus, guacamole and other yummy foods. The downside with an immersion blender is that you have to do the “stirring” manually by moving the stick around, unlike a blender.
. Although it’s expensive, it can be used for more than just baby food recipes. If you’re a smoothie fanatic, margarita lover, dip connoisseur or just love having great kitchen gadgets, this blender is a great addition to your appliance. You’ll need a jar or container of some type to put the baby food in. Before buying something, we suggest asking your friends or family with kids if they are purchasing their baby food (if you don’t feel like you’re prying). If so, ask if they’ll keep the jars for you. Then, you can reuse their old jars and save yourself a few bucks. If you need to purchase some containers, here’s some good glass jars we suggest. Are you wanting to make a large supply of baby food and freeze some of it? These freezer trays include a silicone lid and are BPA free. The tray is used in the freezer, oven (460°F), microwave and dishwasher to make for easy prep, cooking and cleaning. We’ve got a couple of recipes here in this article (see below) for you, but you’ll probably want to introduce your baby to other fruits and vegetables besides the ones included in those recipes. 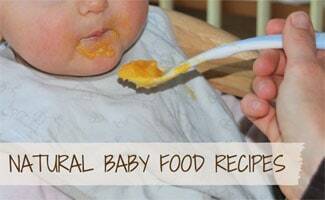 This cookbook is a great resource for baby food recipes. It includes more than 200 recipes for baby purees so you can introduce your baby to new foods that are right for her. Making your own baby food can be fun! Here are three recipes we think your baby will love. Make sure you pay attention to the age range for these recipes. You don’t want to give your child food before she’s ready for it. In a pot, bring the sweet potato and water to a boil for 15 minutes. If it’s too watery boil it for longer, and if it’s too thick add some water to it. The sweet potato should break down after being boiled. Add the mixture to your choice of blender (from above) and make it the desired texture. Let cool and serve. You can freeze this puree and thaw and reheat it in the microwave when you’re ready to feed it to your baby. Add ingredients to your blender and puree until smooth. Combine ingredients in your blender and blend until you reach the desired consistency. You’ll probably need to scrape the sides of the container every once in a while. You also may need to add 1 tablespoon of water to achieve your desired consistency. This recipe lasts 3 days in the refrigerator or 1 month in the freezer. This video is a great resource for knowing what to do with your baby food after you’ve made it. From normal parents to celebrity moms, making your child’s baby food yourself is a rising trend. In fact, here are 6 celebrity moms who make their child’s baby food. Don’t feel like it’s too big of a task for you to do. Sure, it’s something you’ll have to spend a little time doing, but it’s something you can handle. Why do you want to make your child’s baby food? Yum! These sound soooo good I might eat some of these myself! I have a rubber ice cube tray which might work to make extras to freeze (great idea for busy moms!). Parents should be more mindful and not feed their kids junk, it’s so depressing. We agree, healthy eating is the way to go especially for little ones!